This article is about the television series. For the 1934 film, see Designing Women (film). For the 1957 film, see Designing Woman. Designing Women is an American sitcom created by Linda Bloodworth-Thomason that aired on CBS from September 29, 1986, until May 24, 1993, producing seven seasons and 163 episodes. The comedy series Designing Women was a joint production of Bloodworth/Thomason Mozark Productions in association with Columbia Pictures Television for CBS. The series centers on the lives of four women and one man working together at an interior designing firm in Atlanta, Georgia called Sugarbaker & Associates. 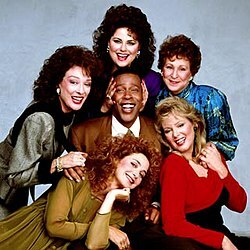 It originally starred Dixie Carter as Julia Sugarbaker, president of the design firm; Delta Burke as Suzanne Sugarbaker, Julia's ex-beauty queen sister and the design firm's silent partner; Annie Potts as head designer Mary Jo Shively; and Jean Smart as office manager Charlene Frazier. Later in its run, the series gained notoriety for its well-publicized behind-the-scenes conflicts and cast changes. Julia Duffy and Jan Hooks replaced Burke and Smart for season six, but Duffy was not brought back for the seventh and final season, and she was replaced by Judith Ivey. The title of the series is a play on words using the old American-English phrase “designing women” which, in its original usage, described women who were constantly scheming by concocting various “designs” or surreptitious plans. The dual entendre within the title is that the almost entirely female cast works in and around the Sugarbaker Design firm and are often seen discussing their love lives and related plot twists centered on their private lives and other interspersonal dynamics. The exterior of the house seen in the series as the location of the Sugarbaker's design firm, a normal house with a front door with only two windows on both sides of the door, is located in the historic Quapaw Quarter district in Little Rock, Arkansas. Additionally, the home of Suzanne Sugarbaker seen in the series is the Arkansas Governor's Mansion, also in the Quapaw Quarter. Both homes are listed on the National Register of Historic Places. When the show debuted in CBS's Monday-night lineup in 1986, it garnered respectable ratings; however, CBS moved the show several times to other time slots. After dismal ratings in Sunday night and Thursday night time slots, CBS placed it on hiatus and was ready to cancel the show, but a viewer campaign saved the show and returned it to its Monday night slot. The show's ratings solidified, and it regularly landed in the top 20 rankings. From 1989 through 1992, Designing Women and Murphy Brown (which also centered around a strong, opinionated female character) aired back-to-back, creating a very successful hour-long block for CBS, as both shows were thought to appeal to similar demographics. The show was a top 30 hit for three seasons, from 1989 to 1992, in which the 1989–1992 seasons made it the most successful of the time and helped CBS, which struggled in the ratings around the late 1980s. Show creators Linda Bloodworth-Thomason and Harry Thomason were strong supporters of longtime friend and then-Democratic nominee for President of the United States, Bill Clinton and his wife Hillary. In one episode, Julia is stranded in the airport while attempting to attend Clinton's first inauguration. Additionally Charlene mentioned working for Clinton during his Arkansas governorship. Yet another Clintons-related joke was the introduction of the prissy character, Allison Sugarbaker, who makes it quite clear to the other "Designing Women" that she attended Wellesley College (Hillary's alma mater). One episode revolved around Julia running for commissioner, where she debates on television against a conservative candidate, to whom she eventually loses. In reality, Dixie Carter was a Republican who disagreed with some of the liberal views expressed by her onscreen character, although she did become a Clinton supporter. Shout! Factory has released all seven seasons of Designing Women on DVD in Region 1. On September 2, 2003, Sony Pictures released The Best of Designing Women, a single-disc DVD featuring five episodes ranging between seasons one through four: "Designing Women (Pilot)" (season 1), "Killing All the Right People" (season 2), "Reservations for Eight" (season 2), "Big Haas and Little Falsie" (season 3) and "They Shoot Fat Women, Don't They?" (season 4). On September 28, 2010, Shout Factory released Designing Women, Volume 1, a single-disc DVD featuring seven episodes from the first season: "Designing Women (Pilot)", "A Big Affair", "Design House", "I Do, I Don't", "New Year's Daze", "Monette", "And Justice for Paul". Further selected episode volumes have yet to be announced. On June 5, 2012, Shout Factory released Designing Women – 20 Timeless Episodes, aimed for casual fans to enjoy the series without buying full season sets. The 2-disc DVD set included the following episodes, ranging from seasons one through five: Disc 1 – "Designing Women (pilot)" (season 1), "New Year's Daze" (season 1), "Monette" (season 1), "Oh Suzannah" (season 1), "Ted Remarries" (season 2), "Killing All the Right People" (season 2), "Heart Attacks" (season 2), "Return of Ray Don" (season 2), "Big Haas & Little Falsie" (season 3), "The Wilderness Experience" (season 3). Disc 2 – "The Naked Truth" (season 3), "Stand & Fight" (season 3), "Nightmare from Hee Haw" (season 3), "Julia Gets Her Head Caught in a Fence" (season 4), "Julia & Suzanne's Big Adventure" (season 4), "Foreign Affairs" (season 4), "A Blast from the Past" (season 5), "And Now, Here's Bernice" (season 5), "This is Art?" (season 5) and "The Pride of the Sugarbakers" (season 5). CBS ran reruns of the show in their daytime lineup at 10:00 a.m. (EST) from April 1991 to June 1992. Subsequently, Designing Women aired on the Lifetime cable network for over a decade. Despite its popularity, the show left the network on August 4, 2006. A 90-minute retrospective special, The Designing Women Reunion, aired on Lifetime on July 28, 2003, reuniting Burke, Potts, Smart, Carter and Taylor in which they shared memories from their time on the series, and also featured interviews with the Thomasons and various writers. Actors Alice Ghostley, Hal Holbrook, Gerald McRaney, and Richard Gilliland also took part in the special. The series also aired on Nick at Nite beginning October 2, 2006; however, it quickly left and later appeared on its sister network TV Land, airing at various late-night and morning times occasionally until the network lost the rights to air the show in 2008. The series also aired on ION Television in 2007, Monday through Thursday at 7:00 & 7:30 pm ET. The program currently airs on the Comedy Gold (formerly TV Land Canada) in one-hour blocks every day at 11 am and 5 pm EST. TV Guide Network also began airing a one-hour block weekdays at 11 am EST in October 2011 and currently airs a two-hour block, weekdays from 3:00 pm (EST & PST) to 5:00 pm (EST & PST). As of May 2014 reruns air on the LOGO network. In recognition of the show's 30th anniversary, GetTV began running "Designing Women" in June, 2017 with nightly blocks featuring 30 fan-favorite episodes. The show will go into a regular time slot after these 30 episodes. Also in June 2017, FETV is also showing reruns of the show. ^ VIRGINIA ROHAN (April 14, 2002). "'Once & Again' won't be back". North Jersey Media Group. Archived from the original on June 10, 2007. Retrieved July 13, 2007. ^ "Star of TV's 'Designing Women'". Washingtonpost.com. Retrieved September 29, 2016. ^ Designing Women: The Final Season: Dixie Carter, Annie Potts, David Trainer: Movies & TV. Amazon.com. Retrieved on April 21, 2012. ^ ION Television July: Designing Women and Who's the Boss? Join Line-Up; Still Standing Joins Atlanta TBS; Network Notes. Sitcomsonline.com (June 8, 2007). Retrieved on April 21, 2012. "Killing All the Right People"
This page was last edited on 27 February 2019, at 05:42 (UTC).